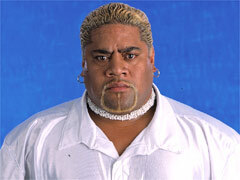 Rikishi reappeared in the Federation in late 1999 after a long absence with a new look and a new attitude. Eventually teaming with Too Cool, the sumo from Samoa danced into the hearts of Federation fans everywhere as he and Too Cool found success in the singles and tag team divisions. In October of 2000, Rikishi's fan base virtually disappeared when he admitted that he was the one driving the car that had taken Stone Cold Steve Austin out of commission at the 1999 Survivor Series Pay-Per-View. Since then, the Samoan monster has used his devious mind -- as well as numerous Banzai Drops -- to carve a path to the upper echelon of the Federation ranks.